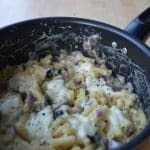 This Baked Mac ‘n’ Cheese recipe is based on the way I’ve seen my mum make Macaroni Cheese over the years, but customised for my current feel-good palate. It serves two and takes less than 20 minutes to make. Start of by boiling the pasta. Put on on in a pot of salted water and get it to a stage where it’s almost cooked, but still a minute or so off. Put the grill on at the same time, let it warm up. Chop your onion up into small pieces – as small as you realistically can – and coarsely grate your cheddar. Put the oil in a large pan – larger than you need to make a roux – and once it has warmed up add in the onion and garlic, allowing them to soften, but not brown. Start to boil the pasta. When the onions start to soften add in most of the milk and let it start to gently heat up. In a separate bowl, mix your flour with a little milk, stirring the flour in (this is so there are no lumps when you pour it in). Pour the flour mix into the warming milk and stir it in, then pour in the cheddar (remember not to let it boil). Continue to heat and stir until it forms a thick, cheesy sauce. One the pasta is ready, drain it and add it in to the sauce along with the parsley, stirring it all though. Taste to ensure it is properly seasoned, then tear the mozzarella into chunks and scatter over the top. Bake under the grill until the cheese has melted. Serve with crusty bread.